Online shopping is still becoming more popular, and clients are still more demanding. In order to fulfill clients’ expectations, it should be in the first place ensured that your online shop functions reliably and can be intuitively operated. To make sure that an online shop really ‘sells’, it is imporant to select solutions which suit the expectations and needs of customers. When developing an e-shop, we always begin with an analysis of the target group and study the approach of direct competitors. A deep understanding of buying processes and factors which contribute to the client’s discontent is a key factor in the e-commerce industry. The creation of online shops for business purposes is a process which demands dedication and knowledge of e-commerce trends. Online shops developed by us are based on our knowledge, experience, and passion for intuitive internet solutions. We always care about modern design, perfect product pictures, and contents depicting the product in the best possible way. An online shop has to fulfill certain requirements which affect sales. Our projects are characterized by a very transparent structure which permits all clients to easily find the products which appear interesting to them. In addition to this, we make it for the user as easy as possible to place an order, choose the desired payment method, and to continue shopping after putting an item into the shopping cart. 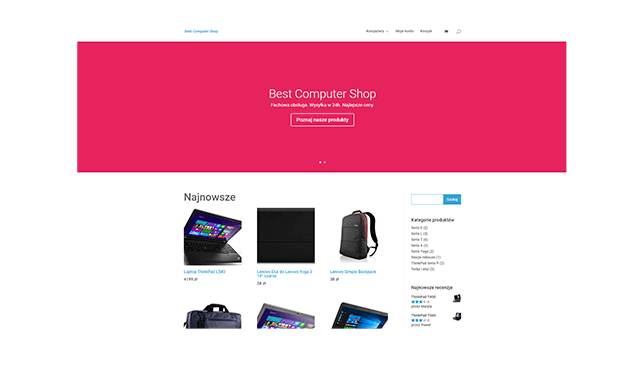 Our company specializes in designing transparent and legible online shops which invite recipients to perform a certain action. We always hand out advice to our clients and analyze their marketing goals as well as customers’ wishes. We work in two directions – we provide our clients with the best solutions and fulfill customers’ expectations, too. In the advertising industry, creativity has no limits, and thus we can guarantee innovative ideas and an individual approach to every project. We know from our experience that the best strategy for developing online shops is to think like a client. Whether clients choose a certain shop depends mainly on the circumstance whether we are able to fulfill recipients’ needs. Despite the enormous competition on the market, potential clients do not always get what they expect. We follow current trends and are thus able to ensure the fulfillment of all marketing goals.